So you are finally home from the hospital with your new baby….! It is the most amazing time until the panic sets in….how do I look afer this little creature? Here are some simple tips as gathered from experience, and in the case of one of us, the assistance of a very experienced (and scary) maternity nurse. All you need is water! When pregnant and preparing for the arrival of your baby, do not get carried away into buying loads of lotions, baby bath products and wipes. For the first few months, all you need is water. For nappy changes, use warm water and cotton. We found the oval cotton pads much easier to use than the thick cut cotton wool which leaves cotton residue. Clean from the front to the back and do not forget those little creases under the legs. Dry extremely well with a muslin. For the bath, which for newborns is not recommended on a daily basis, just water will do. Many new parents agonise over the temperature of the bath. Invest in a thermometer or use your judgement. The midwife at the hospital told us that the water should feel comfortable to the hand; we found this more helpful than a thermometer. Sudocream – also ideal for mum’s spots! The maternity nurse would add a little sudocrem at every nappy change. Views vary and the health visitors recommend a more limited use. We settled in the middle, using sudocrem for the last nappy change before putting the baby down for the night (as that nappy tends to stay on the longest) and once during the day. As an added bonus, sudocrem works wondes on spots. A friend suggested this and it made my spot almost vanish – just try to remember you have it on when the doorbell rings. Olive oil. This is not the kind you add to your salad, but a more purified form ideal for baby care. You can find it in most pharmacies and you should use it after the bath, to moisturise the delicate baby skin which due to the harsh water in most cities, has a tendency to dry. Babies develop special skin habits and conditions, so it is best not to invest in any baby moisturising lotions until much later. Both our babies had different skin irritations and we ended using specialist products recommended by the health visitor or the doctor. The umbilical cord is scary! Here at moomboo corner we are always honest and we are not afraid to admit that the umbilical cord scares us. Logically, you know that it is not hurting the baby but it looks painful….Make sure you keep it clean and dry. Only use warm water and cotton and dry off very well with a muslin. Any umbilical cord discharge with a funny smell should be checked straight away. Top and tail. Another one of those terms you hear a lot. All it means is that, as newborns do not need a bath every day, the head and bottom should be cleaned on a daily basis. There are special ‘top and tail’ containers in the market. We do not think you need this. Fill a bowl with warm water and clean around the eyes (from the centre out and using a different cotton piece for each eye), clean behind the ears and the whole face. Then move to the bottom and give it a good clean. We know its tempting to stock up on all sorts of branded, hypoallergenic, soft, baby products. And we understand its part of the overall experience, but there really is no need to splurge! In fact, if you wait until your baby comes home and is a few weeks old before investing in creams and things you will be better off. One of us had a baby that suffered from eczema (a severe dry skin condition which is rather common in young babies). As it turned out we had to throw away all our goodies and buy prescriptions and a few over the counter little gems of products. In case you are wondering those were (keep in mind these are for when your baby is little older): (1) Epaderm – this a great vaseline like cream which can be applied all over the body (and is great for mommy’s dried up cuticles from all the washing and cleaning) and (2) Aveno bath oil water emollient particularly good to soften London water for the babies bath. Just add a few drops before you put your baby in and you’ll see it will help your baby’s skin stay smooth (and also smell nice!) (3) Dermol– although it is another water emollient, it also works as a soap (which doesn’t lather and thus doesn’t dry up your baby’s skin). Of course, before you treat your baby’s eczema make sure to check with your pediatrician or GP, but these creams are great to keep older baby’s skin feeling nice and soft! Our list is by no means exhaustive, but we’ve tried to minimize the expense for parents while maximising the comfort for babies (and softness of their skin – who doesn’t love to kiss those smooth baby cheeks?) 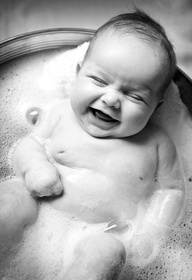 Please send us your tips for newborn care and any pictures of your cuties in the bath! This entry was posted in Changing Tips, Unnecessary Baby Items and tagged bath time, caring for baby, newborn care, top and tail, umbilical cord on January 16, 2013 by moomboo.